If you want to make a flash web form on your own and you do not want to flip through pages of ‘super-heavy’ computer books, then just go through what I have written here. I am pretty sure that by the time you are finished reading this article, you would be all set to make a web form on your own! So what is it that you need to know to make a web form in Flash? Well, there may be many things but the below mentioned 14 tips would surely help you a lot. There are tons of helpful tips, but I have picked out just 14 for the sake of abstraction. # Tip 1: Label’s a must. Although labels are not required for proper functioning of a Flash based web form, but they are strongly recommended. They help associating input boxes with their respective functions. Moreover, the use of labels is semantically correct. # Tip 2: Labels need to be floated. A table like structure can be created using labels. All you have to do is to align the labels well. Keep a static width, float it to a bit left and put the text on the right. That’s all! # Tip 3: DO NOT mess unnecessarily with default styling. Most of the browsers have default styling for input form elements. This ensures that users have a consistent user experience. So you need to think twice before changing the default styling. An easy way to change the default styling while making a web form in Flash is to utilize the CSS Reset technique. This makes sure that borders don’t appear around objects and it undoes the default styling of the input buttons too. # Tip 4: Use a pseudo class. This feature would enable you to develop a web form in Flash that changes the styling of input buttons and text areas only when they are clicked upon. 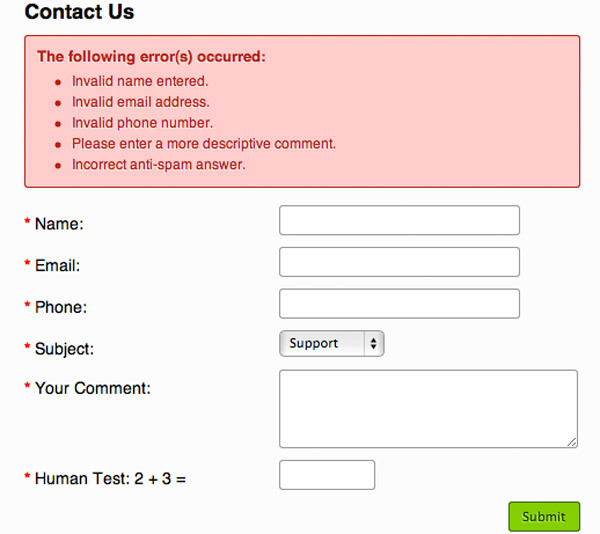 # Tip 6: The most important thing about a web form is that it should work. A Flash based web form needs to have an interface connected to a database and should be able to send an email as well. # Tip 7: Do not use too difficult Captchas. Though Captchas are good to block spam, but many times they block conversations as well. A little bit of spam never killed anyone. Losing conversation to block spam is a bad trade-off. Even if you have to use Captcha, take care that it can be read easily. # Tip 8: Remove unnecessary fields as they might put off users. Include only important fields. This goes for all types of forms. Do you really require the gender and date of birth of your customers? They might not think it’s an invasion of privacy, but if they are as lazy as you and me, they might just abandon the form because it was taking too long to fill up. # Tip 9: Do not put the clear button too close to submit button as users might delete their information accidently. Just a small mistake and all the data is wiped out. Will they fill out the form again? I won’t bet on it. # Tip 10: Use variable names that are easy to remember and use. If you want to send data to some other web page, then you should have access to contents of the input fields. Assign easy names to the variables that are collecting input values so that you can use them easily later on. 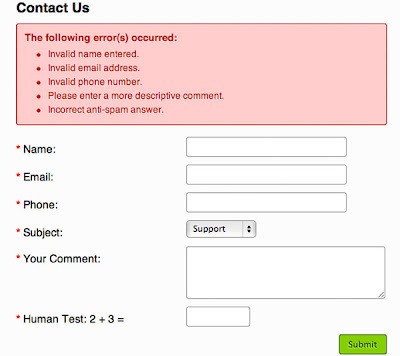 # Tip 11: Clear all error messages that may pop up in the Flash based web form. Too many error messages just lead to frustration. Give your users a simple form that doesn’t make them tear their hair out. No-one likes error messages popping out of nowhere. # Tip 12: AJAX Validity is important for validating the information that users have typed in. There are many websites that validate the inputs the instant you go to the next field. This doesn’t break the flow, and hence is very effective. It is easier and less painful to correct an error there and then rather than going back and correcting the errors collectively. # Tip 13: Do not add requirements for complex passwords. Let users go for the password of their choice. There are many websites that tell the users that the password is too weak and cannot be used. This might frustrate them because most users prefer to have the same password for websites of similar nature. Also, do not make restrictions on the upper limit of the number of characters of the password. Do not tell them that they cannot have a password because it is too long.